A subtle, understated shooting accessory that offers a bargain price for the heavy feature set it boasts, these over the ear, ear protection from Champion offer good performance without a heavy cost. 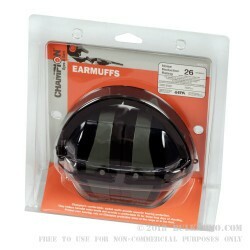 The Green and black earmuffs are a comfortable over the ear model with enough pressure to keep the 26 dB NRR rating in tact without exerting too much pressure on your head. It makes it easy to justify using internal plugs as well for super sensitive shooters who need a cheap alternative to bulky, uncomfortably snug, higher NRR muffs. The price makes it easy to justify grabbing a few extra pairs to have in case you find yourself at the range with the whole family, or with guests, teaching them how to shoot. The relative quality and good reviews help to make this an easy choice. Generally, you’re getting a good value for money on these and they are high quality, long lasting ear protection that keeps you focused on the targets instead of how uncomfortable your are – because they defeat the other issues you find with bargain hearing protection. A bulk discount is available as well.